If you have ever been to temples in South India, you might have bumped into(even literally) this magnificent creature of Indian mythology. The Yali, the lesser known protector of the Gods and the temples that house them. Even me, in spite of my countless visits to temples since birth, have never really paid attention to this mythical creation, that adorns almost every pillar, roof and corners of the fantastical world of temple architecture - an integral part of Hindu sculptural antiquity. They say the Yali protects the temples, roaming the rock confines of darkness and light. Although they look it, they are neither the Lion nor the Elephant - a potent combination of the two, the invincible dual-soul that makes the spine of every human tremble. The eerie-ness of its appearance can itself fascinate and shake your inner soul. 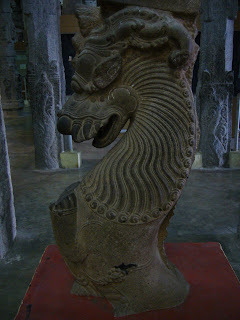 Yali (pronounced yaali) Tamil: யாளி is a mythical creature seen in many Hindu temples. These are also known as Vyalam or Sarabham, in Sanskrit. 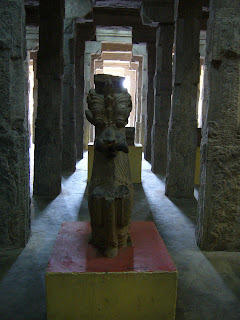 Yalis are often sculpted on the pillars of Hindu temples. Yali is a mythical lion, and it has been widely used in south Indian sculpture. Description and references to yalis is very old, but its depiction in the south Indian sculpture became prominent from the 16th century. Yalis are believed to be more powerful than the lion or the elephant. These shots of the Yali were taken at the Aayiram Kaal Mandapam(The Thousand Pillar Hall) at the Meenakshi Amman Temple in Madurai, which was a frontrunner in the election for the modern seven wonders of the world for its architectural importance. By the way, in spite of its significance and wondrous appearance, the Hall has not been maintained by the authorities very well. Dusty sculptures and cobwebs galore. Damn the *&%king bureaucracy (partial source - wiki). I am very much fascinated by Yali and need to understand its origin. Please let me know if you ever came across some studies or articles written on yali.